More different than before. As in, this time it’s European! Gothic, to be precise. And I’m kind of loving the process. Anyway, short story is that Baroness Marie, my one-time apprentice sister, is being elevated to the Order of the Pelican very soon (like, next weekend), and asked me to make a book for her. And since I had NOTHING to do (translation: I do not have a healthy sense of self-preservation) I agreed. 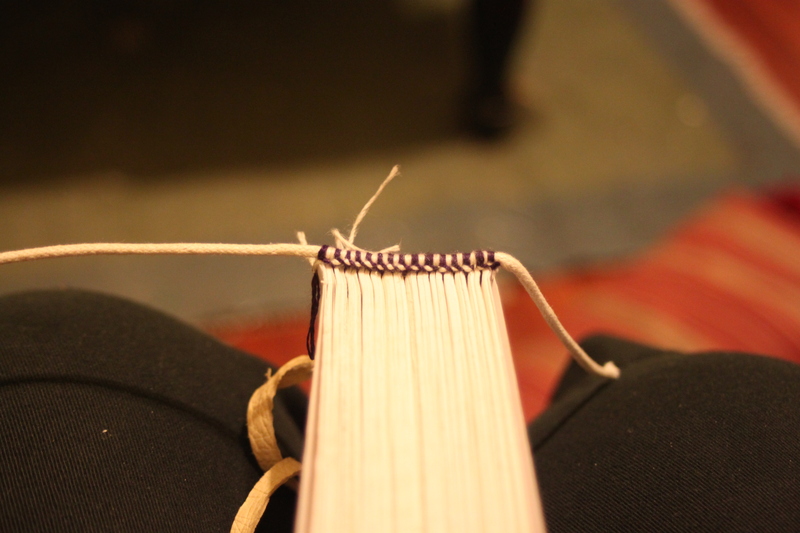 Did I mention I’ve never bound one of these before? I’ve never bound one of these before. The biggest lesson I learned was that all the extra equipment you think you won’t need is actually stuff you really, really need. 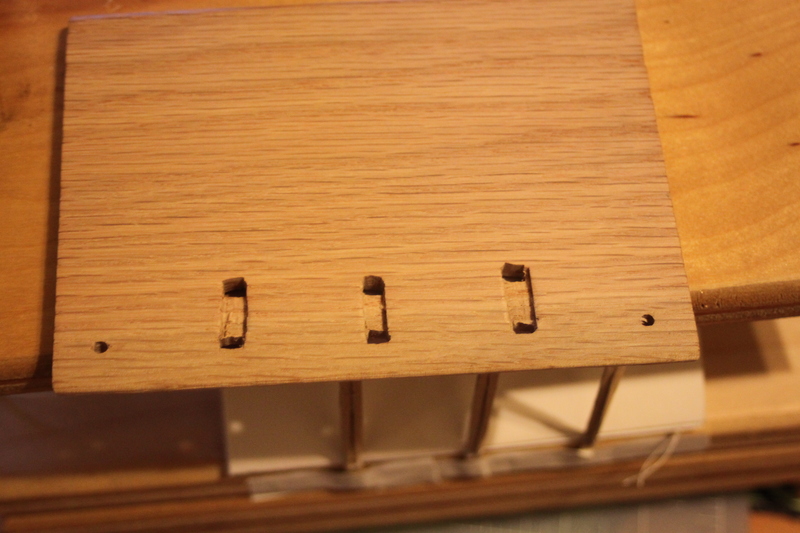 Like that sewing frame. And a finishing press. Yeah. 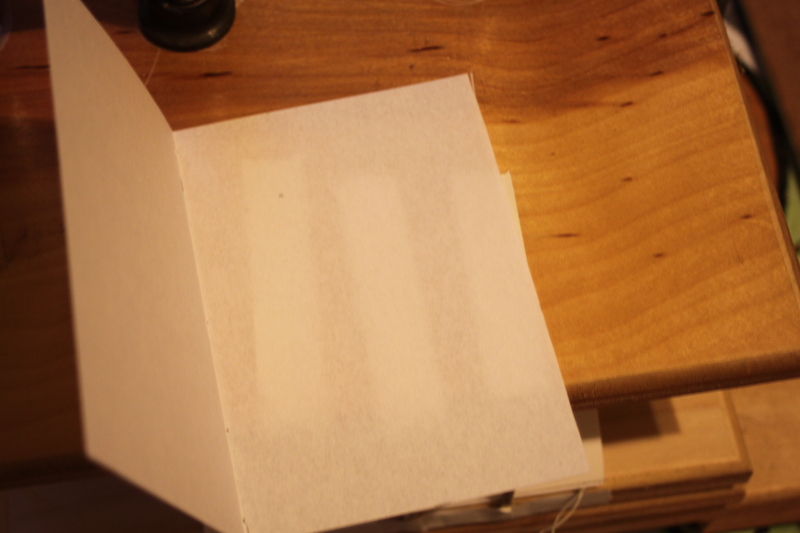 However, I, the intrepid and ever-resourceful bookbinder, have made this all work ok. These books date from the late 13th-15th centuries, and are the successor to the Carolingian-style binding. One of the biggest differences in the two bindings is that these books were bound in the era when paper became something people used to write or print on, and so you get a lot of variety in materials. This is the era of the girdle book. This book is going to be a girdle book. Because most books before this style were created using parchment text leaves, the covers were made primarily of wood, which was sanded and rounded and carved with channels for the sewing supports, which in turn attached the book block to the cover boards. This is one of the main differences between the books I usually bind and this new one, since the ones I usually bind are pretty exclusively paper-based, and everything is just sort of glued in place. So the first thing I did was to find a friend with a woodshop, and have him cut and shape the boards for me. Technically, I think this step is supposed to happen after you sew the book, so that you can make sure the holes for the supports are in the right places and deep enough, etc, but we were on a time crunch, so he did these first. He is a genius. Covers! 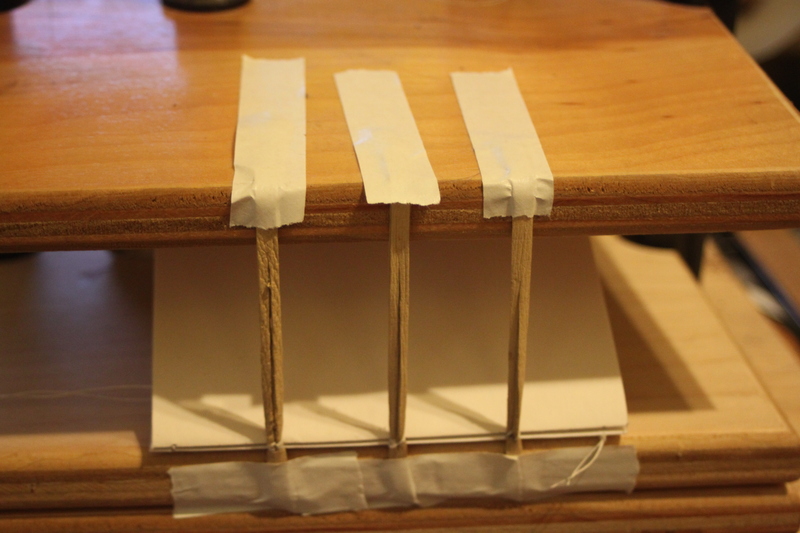 I didn’t have a sewing frame, so i sort of rigged up one with the also rigged-up book press I am borrowing from Master Lorenzo. It kind of worked. Which is to say, not really at all, but I made do. Also worth mentioning is that those leather bits? Not the alum-tawed sort I needed, but I did not have time to source alum-tawed hides in anything smaller than something costing me at least $100. Not ideal, since you can see exactly how much I used. I laminated a couple of pieces of lining leather together using PVA adhesive, which worked well enough for a first time run. The paper is not rag laid, but instead is calligrapher’s parchment, which while the wrong texture is pre-sized for use in calligraphy and should hold up to lots of well-wishing writing. Apparently lots of historical binders use this? Who knew? Anyway, it works very well for its intended purpose. 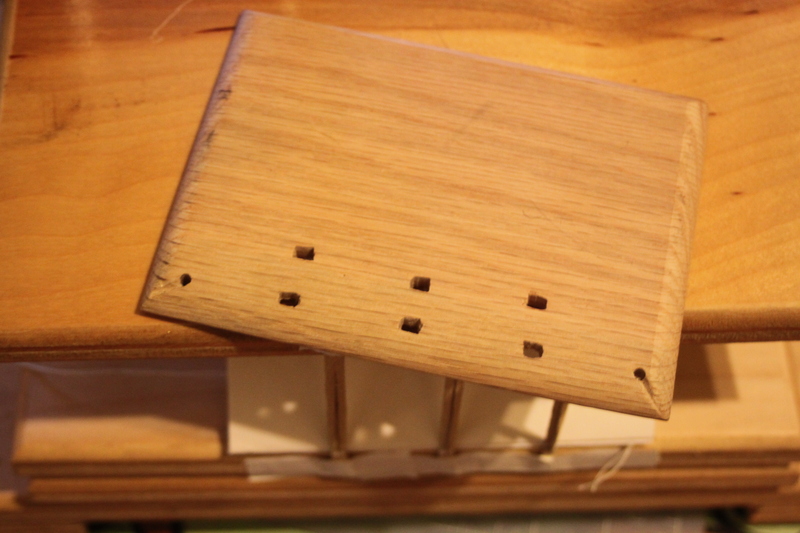 And so then, we have book block! It is lovely. It terrified me to pound on the spine, but somehow it worked out. I was so scared that I was going to break the sewing thread. I should have remembered that due to my lack of sewing frame, the threads were fairly loose, and not prone to breaking. Duh. 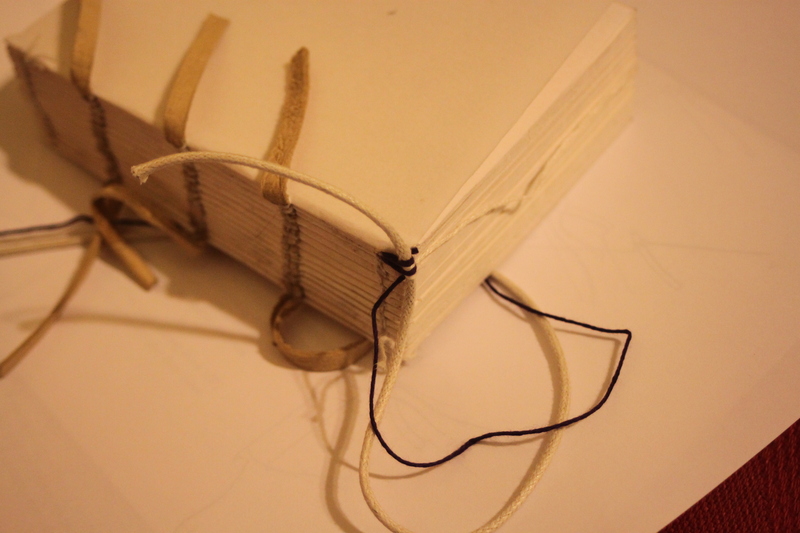 You’ll also see that I had to trim it after I rounded the spine, and then had to round it again. Lesson learned. 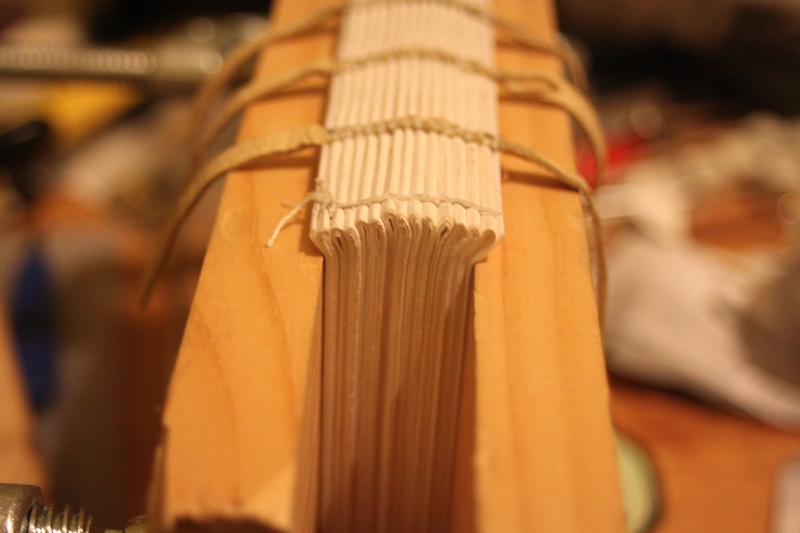 So with a nicely trimmed spine (using my “plough” of a very sharp, long utility knife), I set about doing the endbands. YOU GUYS. These are so much easier than the Islamic chevron endbands IT IS SO NOT EVEN FUNNY. Chevrons: weave a tiny strip of fabric using only a needle and some determination! This: wrap some silk like you do, and even if you screw up it’ll still look good! Seriously. I am not joking. And so there you have a book block! Hooray! Tomorrow’s installment: attachment of the covers and leather. Very exciting! 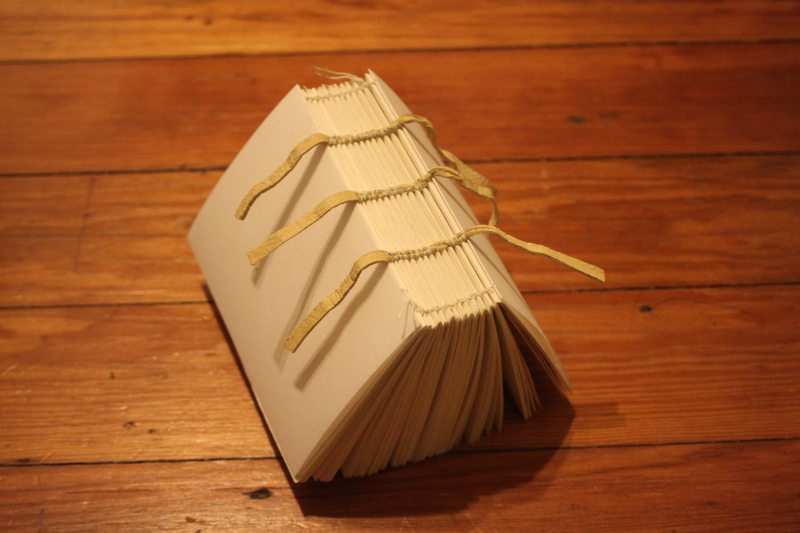 This entry was posted in book, bookbinding and tagged book, bookbinding, gothic, medieval, sca. Bookmark the permalink. I’m fascinated with the idea of bookbinding and am in awe of your skills (particularly in conjunction with your ‘I’ll make this work’ attitude). Looking forward to seeing the complete work. I’m going with the idea that I’m using skills that I, an Islamic-style bookbinder would have and conceivably repurpose when given a task such as this. Sometimes it’s a good thing, and sometimes I end up doing a lot of “D’oh!” later on. I usually have to weigh my desire to do it correctly against my need to get it done by a deadline.